This traditional Alabama barbecue sauce is unlike any other barbecue sauce you might be familiar with. First of all, it's white, rather than red, and not made with a tomato or fruit base, but mayonnaise instead. It's creamy, tangy, peppery, and slightly sweet if sugar is added with a rich flavor that is a great addition to most grilled foods but especially chicken, turkey, smoked pork, and grilled fish. Just like a red sauce, this white sauce can be used to marinate, grill, and as a table sauce. 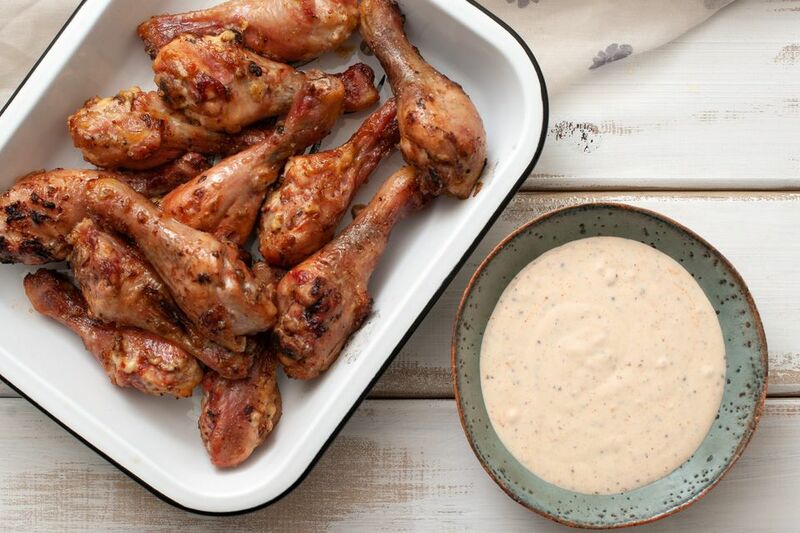 But it has a leg up on the red stuff because white sauce makes a great dip, salad dressing, baked potato top, and even a binding agent for coleslaw and potato salad. As with many barbecue sauces, you want to apply this only at the very end of your grilling or smoking, especially if you add sugar to the basic ingredients. Not only will it break down and separate if it is heated too long, but the sugar will burn instead of becoming nicely caramelized. In a medium bowl, whisk together mayonnaise, cider vinegar, and lemon juice until creamy and smooth. If you do not want the sauce quite as tart, use half the amount of apple cider vinegar. Stir in black pepper, salt, cayenne pepper, and optional garlic, mustard, sugar, and horseradish. Cover and refrigerate for at least 30 minutes before using. Brush lightly over chicken, turkey, or pork during the last few minutes of grilling. Since this sauce also is great as a dipping sauce to serve at table, set some aside before you start grilling the meat. Unused sauce can be stored in an airtight container in the refrigerator for 3 to 4 days. To make a great sandwich, place pulled chicken in a large bowl and mix with Alabama white barbecue sauce, tossing gently to coat. Serve immediately on bread or buns of your choice. Bob Gibson, of Big Bob Gibson Bar-B-Q in Decatur, Alabama, is credited with creating white barbecue sauce in 1925. White sauce was never really intended to accompany meats like beef brisket. Instead, it was meant to accompany chicken and turkey and to be used as a finishing sauce rather than as a basting medium while the meat is grilling. Gibson smoked whole chickens for three hours and to keep them from drying out, he devised the white sauce to dunk them in once they came off the pit and were held for service. He thought the fat in the mayonnaise helped them to stay juicy.